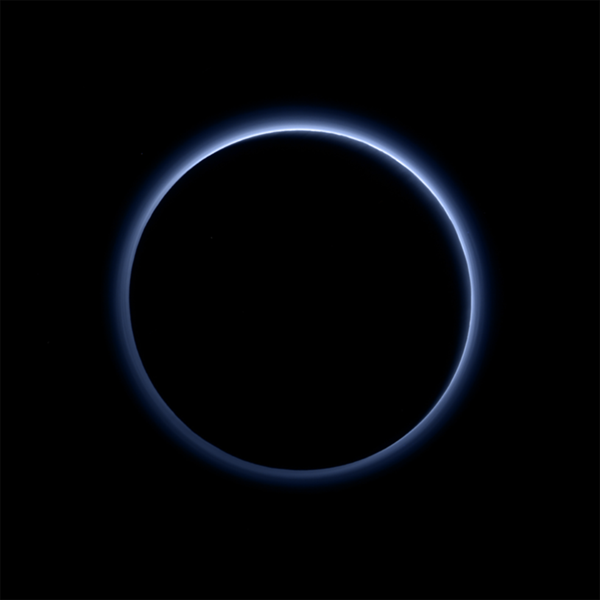 The New Horizons mission reveals a stunning blue haze encompassing Pluto. The particles-known as tholins- responsible for the interesting coloration are formed from various sunlight-initiated chemical reactions of methane and nitrogen. This coloration on Pluto tells us much about the particle composition of the planet’s upper atmosphere. Like on Earth, the scattering of sunlight by small tholin particles are responsible for a blue sky. This unexpected discovery only brings this year’s Pluto-hype to an even higher level. “Who would have expected a blue sky in the Kuiper Belt? It’s gorgeous,” said New Horizons principal investigator Alan Stern. And this next finding raises Pluto to a whole new level of awesomeness. Regions of water ice have been detected in small, exposed clusters on the planet’s surface! Even more interesting is the extremely red coloration of the ice; the cause of this is still under investigation. Yes, Pluto was demoted from planethood. However, it just proves that when someone knocks you down, you have to show them how amazing you really can be. Astronomy, new horizons, pluto, science, Space. Bookmark.